Stocks experienced a pretty sizable reversal on Friday. The indices all opened lower and the losses steepened in the early going, but they reversed course near the middle of the day and three of the four ended up making it back to positive territory. The Dow was the only one that finished with a loss at -0.25%. The Nasdaq led the way with a gain of 0.14% and it was followed by the S&P with a gain of 0.07%. The Russell notched a gain of 0.05%. Six of the 10 main sectors gained ground on Friday while four took losses. The top performance came from the communication services sector at 0.68%. The tech sector was the second best performer with a gain of 0.58%. As for the downside, the financial sector took the worst hit at -0.50% and it was followed closely by the energy sector with a loss of 0.46%. My scans remained negative on Friday and that was the 22nd straight night where that was the case. There were 31 names on the bearish list and six on the bullish side. The barometer had the big negative reading on Thursday at -99.1 and it rose to -76.9 on Friday. There were very few stocks that caught my eye on Friday. 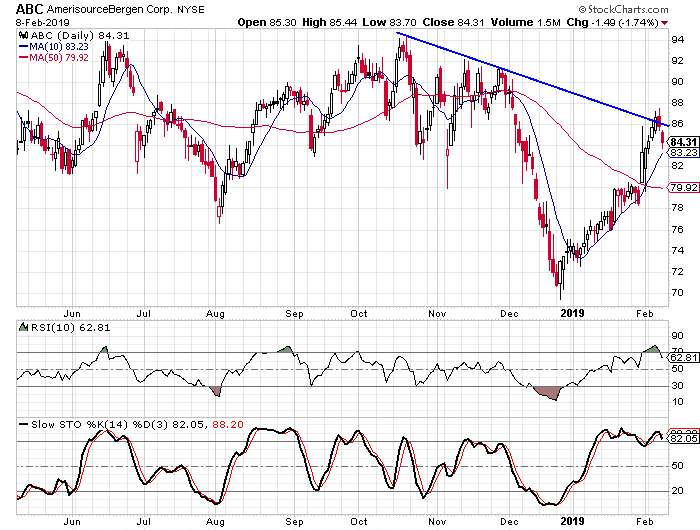 The one that did get my attention was AmerisourceBergen (Nasdaq: ABC) and it was on the bearish list. The fundamentals aren’t that bad with an EPS rating of 64 and an SMR rating of a B. But the chart is what got my attention. You can see how the stock experienced a series of lower highs in the fourth quarter and if you connect those highs in October and November, a trend line forms. The stock managed to move slightly above the trend line on Wednesday, but then fell below it on Thursday and then gapped lower on Friday. Buy to open the March Week 5 $86-strike puts on ABC at $4.50 or better. These options expire on March 29. The options will double if the stock falls to $77 and that is the same area that served as support back in August. I suggest a target gain of 100% with a stop at $87.